Daily Mirror - Sri Lanka Tourism selects 8 American kids for tour of “Monkey Kingdom Trail"
​In the backdrop of a 31.2% visitor arrival growth in July with the US market registering a 19.1% growth Sri Lanka Tourism is targeting the American traveller as a future potential market to be developed by selecting 8 lucky American kids from an online consumer promotion. The epic $16.4 billion top billed Disney movie “Monkey Kingdom” documentary which was filmed in Polonnaruwa, Sri Lanka will be visited by the lucky 8 kids in the phase one and then extended to attract twenty kids into the country and experience the trail that had been architectured in Polonnaruwa. The movie considered by many as a spectacular tale which is filmed entirely around the sacred city of Plonnaruwa, Sri Lanka features a features a troops of monkeys and the footage captures the nature which attracted the true animal and nature lovers of all ages that costed the producer a staggering $7 million and now we want to extend this success to the focus markets of France, UK and then in China which will be using this as a vehicle to build the equity of Sri Lanka as a tourist destination on the DNA of diversity, Authenticity and compactness said chairman Sri Lanka Tourism Promotions Bureau Dr.Rohantha Athukorala. 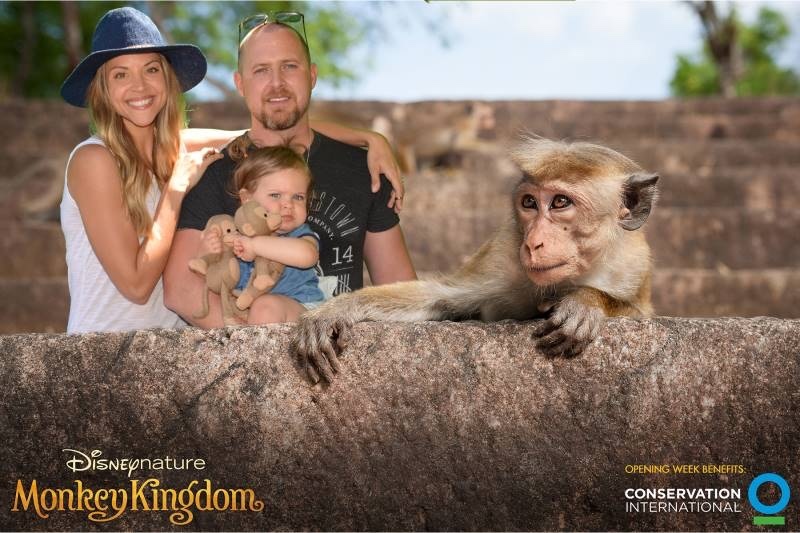 The movie directed by Mark Linfield and Alastair Fothergill, who are the co-directors of Disney movies such as “Earth” and “Chimpanzee” has come together for the production Monkey Kingdom, the movie evolve around Maya and her family which considered be toque macaque monkeys. As per the movie Maya’s world changed when her son Kip become the part of the extended family. These characters keep the audience alive by making them laugh and touching their hearts throughout the movie which supports the brand building story about Sri Lanka said Chairman Athukorala. Disney has released a 100 page educator guide which includes the lessons and activities of school projects and quizzes targeted to grade 2 through 6 which is important to Sri Lanka as this will help us build equity about Sri Lanka as a tourist destination in targeted families when it launched in countries like China. This can appeal to the environmentally conscious family in china that can propel a trip to Sri Lanka that can have the potential to attract a $250 traveller is the objective. We are also in discussion with authorities in Shanghai to set up the Monkey Kingdom trail in the proposed Disney Park that is scheduled to be launched in 2016 he said. Sri Lanka Tourism has set the expectation for the movie to targeting 50,000 guests out of USA for the year 2015 with the current performance being 26,555 said Assistant Director Marketing at SLTPB Madusha Perera. Hence the campaign has been focused to generate awareness of Sri Lanka and influence the decision making process of a potential traveler she said. Sri Lanka Tourism Promotion Bureau has already focused on the digital campaign with an objective of reaching niche markets from the USA traveller and discussion are at play with key airlines that operate out of the US for joint promotions said Ms. Perera. Sri Lanka Tourism is driving the agenda strongly this year with the west with total tourist arrival as at month of July has crossed the million arrival mark registering a 1,005,855 visitors which is at a 16.8 % growth as against last year whilst 26,555 tourists has arrived from the USA up to July 2015 which account for 19.1% growth.